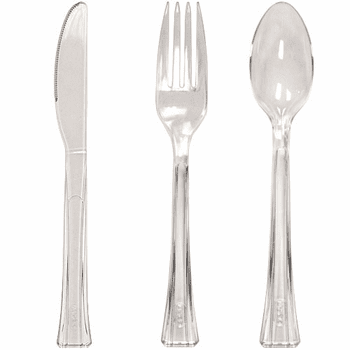 48 Count Heavy duty clear plastic cutlery with an etched design on the handle. Matches the Elegance plates and tumblers. Etched Elegance Clear Plastic Soup Spoons 48ct. Etched Lillian Gold Plastic Soup Spoons 48ct. Etched Lillian Silver Plastic Soup Spoons 48ct.